Ten days ago, I began wearing a FitBit. The Fitbit actually came to me as a birthday gift from my husband, who, after 13 years of marriage, has proven that he's finally cracked the code when it comes to giving me gifts. The morning of my birthday, he surprised me with the world's finest cheese Danish, and then gave me the FitBit. It was a winning, albeit ironic combination. Then again, I've always been a been ironic when it comes to food and fitness--I like to fit into my pants, but I bake (and taste) as part of my job. Dichotomy! Given this, I'm growing to accept that my life in Illinois is going to require a little more mindfulness when it comes to staying healthy and finding balance. Enter this tiny dictator that now lives on my wrist. I'm not even typically a watch-wearing person, so having this device on my arm at all times was at first beyond awkward--no matter how many hours someone slaved designing this piece of technology to render it "sleek and stylish", I couldn't help but feel like I was violating house arrest while sporting it at the gym or grocery store. I also felt like I had been tagged by the government as a person who couldn't control or motivate herself, and so required Big Brother to track her movements. It's not a glamorous feeling, per se. Once I got over that, though, the wearing of the FitBit has become less about being self-conscious, and more about being annoyed at the FitBit itself. So pushy, this FitBit! I already have a three-year-old living in my house, why do I need another one on my wrist? Move! Move! How much have you moved? Let's do it again! Again! Again! Ugh. I find myself needing even more wine, cheese, bread, and dessert in order to destress after a day of wearing the FitBit. And yet, I'm wearing it as I type this. And it can probably hear me and will secretly subtract 250 steps every hour today as punishment. But I will press on with my critique of the FitBit! If you're so smart, sir (and yes, I'm convinced it's a sir), why don't you automatically track calories as I consume them? Because that would be seriously impressive and much more useful than just jamming your tiny elbow into my joy to get me to walk more. And it would be particularly helpful as I embrace my midwestern palate more with every day I live here, craving the glorious treats of this land. You've failed me on that account, Mr. FitBit. Specifically on the day that I decided to make these Buckeyes. Especially since they're a revamp on the classic, a brilliant recipe from Matt Lewis, my baking brother from another. If there's a recipe that would make any FitBit quiver, it's probably something from one of those Baked boys. These are no exception. If you are a fellow FitBit wearer and choose to make these sweet, salty, peanut buttery, chocolaty gems, a) let's start a support group about our co-dependent relationships with our FitBits, and b) just stuff the dang thing in a drawer for a few days until you finish the batch of buckeyes. They taste better that way. This remix on the classic, with the smart addition of cream cheese and graham cracker crumbs, cuts the sugar and tooth-aching sweetness in a traditional buckeye by about half. I found that adding more salt (I like it reeeaaalll salty, so I go for almost 1/2 teaspoon, but you taste as you go and do what you like) helps balance out this candy even further. To make life easier, be sure the melted butter is completely cooled before beating it in, or better yet, use it when it's extremely soft but still in stick form--it will keep the centers from being too schlumpy when you try to form and dip them. I am dreadful at dipping most chocolates, and my buckeye dipping technique could definitely use some help. Most recipes have you use a fork, but I find using my candy dipper set, like this one (although discontinued, I'm sure you could find a similar one at baking supply or craft stores), makes it a little easier. To make the peanut butter filling, in the bowl of an electric mixer fitted with the paddle attachment, beat the cream cheese and peanut butter on medium speed until smooth. Add the graham cracker crumbs and continue beating for 10 seconds. Add the confectioners’ sugar, butter, and 1/4 teaspoon salt. Beat at low speed for 20 seconds to keep everything from flying out of the bowl, then gradually increase the speed until the mixture is completely combined. Scrape down the sides and bottom of the bowl and beat again. Give it a taste and see how you like the balance of salty and sweet and add salt as you prefer; I like my filling to be noticeably salty, like the center of a Reese's peanut butter cup, so I pretty much add the full 1/2 half teaspoon, all told. The mixture will feel slightly dry. Set the peanut butter filling aside while you melt the chocolate. In the top of a double boiler set over simmering water, melt the chocolate (or melt the chocolate in a small, deep heatproof bowl in the microwave, with 30-second bursts of high power, stirring well after each interval). Let cool to tepid (about 100ºF, just above body temperature) while you shape the peanut butter centers. To finish the buckeyes, line a sheet pan with parchment paper or a silicone baking mat. Use a small ice cream scoop or two spoons to portion out level tablespoons of filling and use your palms to roll the portions into balls. 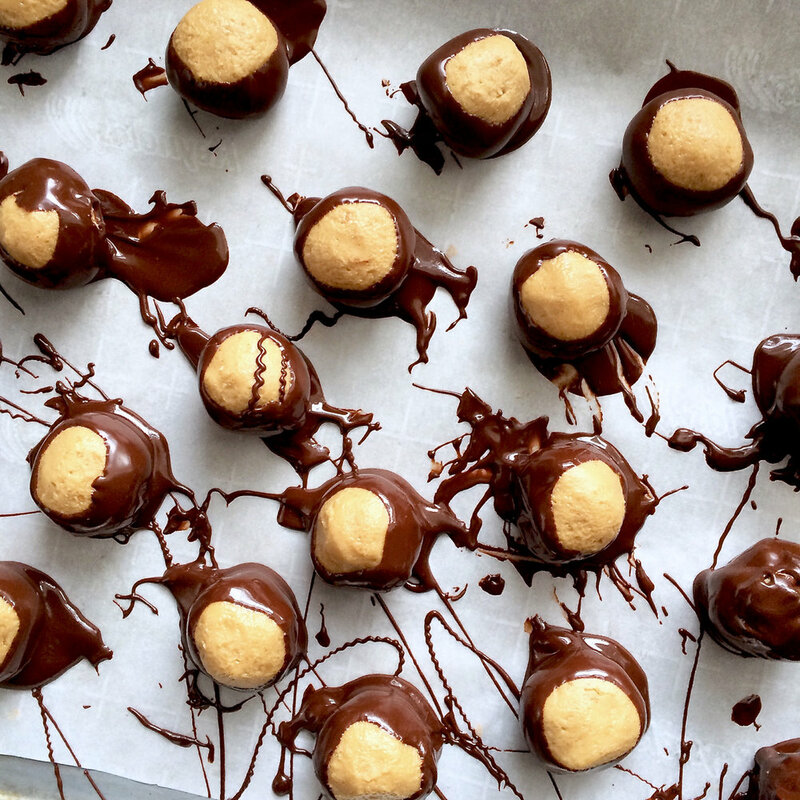 Working one buckeye at a time, using a fork, a large skewer, or a candy dipper, dip each ball into the chocolate. Roll the ball around from side to side to cover almost the entire peanut butter center, leaving a small amount uncovered. If using a fork or skewer, roll the buckeye from side to side so that the dripping chocolate covers the holes pierced in the filling. Let the excess chocolate drip back into the bowl and return each chocolate-covered buckeye to the pan. Refrigerate the entire sheet pan for about 30 minutes to set the chocolate before serving. Buckeyes will keep for 3 to 5 days, tightly covered, in the refrigerator, or in the freezer for up to a month.